We’ve just got back from a whirlwind weekend in Lithuania celebrating the marriage of two very lovely friends. I’m tired, but the lugging a pram down a hill to the picturesque lakeside dinner setting and getting up at 4am to feed a baby confused by the time change tired, rather than the slow lazy sleepiness that comes with daytime drinking and dancing into the night. Weddings with a mini man in tow are an altogether different kettle of fish, and the night before the big day I was in bed by 9pm, snuggling down into the duvet and ordering up chocolate cake on room service. Whenever I’m in need of comfort, chocolate is the order of the day. I’ve blogged over 100 chocolate recipes on this site since 2011 (!) and eaten each one multiple more times, from ice cream and tarts to cookies and cakes. 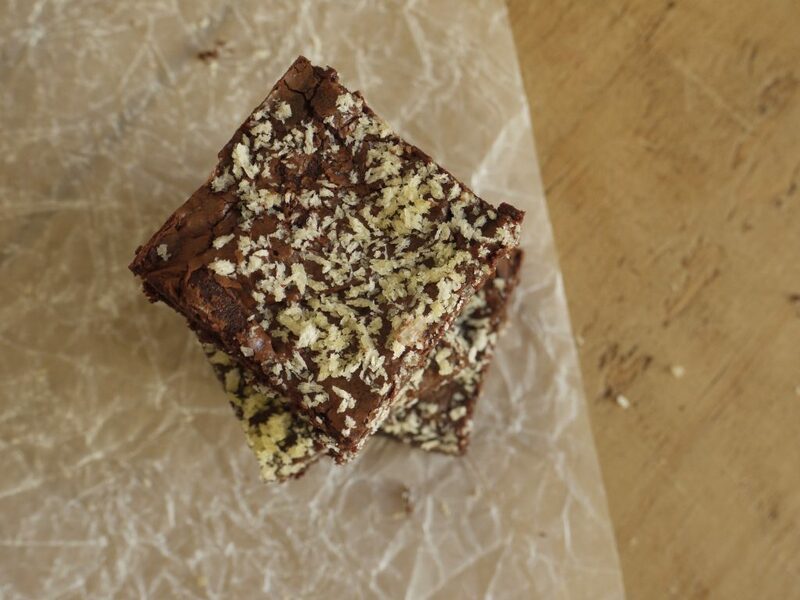 But the staple I always fall back on is the brownie, my desert island dessert. 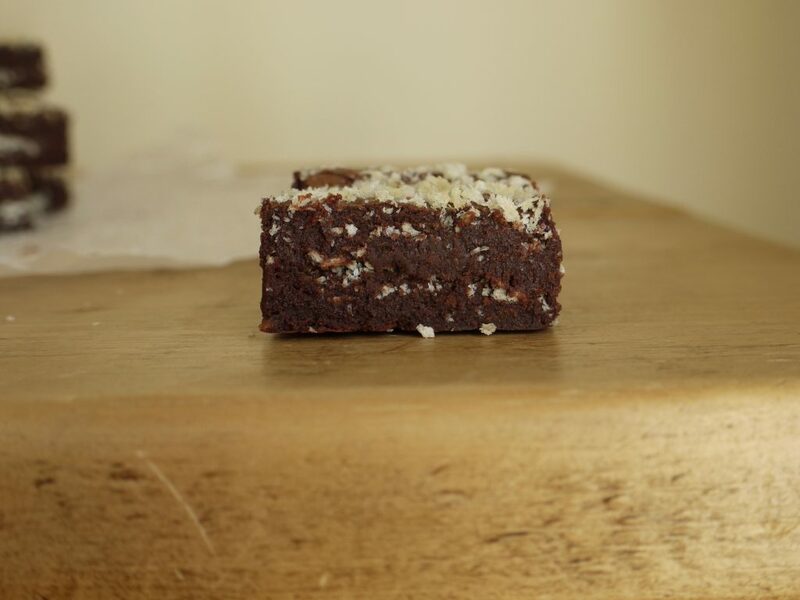 Simple to make but also easy to get wrong, the perfect brownie comes down to impeccable timing and personal taste. Mine is fudgy, dark and teetering on the edge of too rich with a crackly crust and dense interior. I love the smooth intensity of a straight-up chocolate brownie, but I’m also obsessed with contrasts in texture and sometimes it’s fun to throw in some chocolate chunks, nuts or, as on this occasion, a handful of crunchy salted breadcrumbs. When The Japan Centre asked me to work with their panko breadcrumbs, I wanted to develop recipes that showcased their unique texture and delicate, flaky crunch. 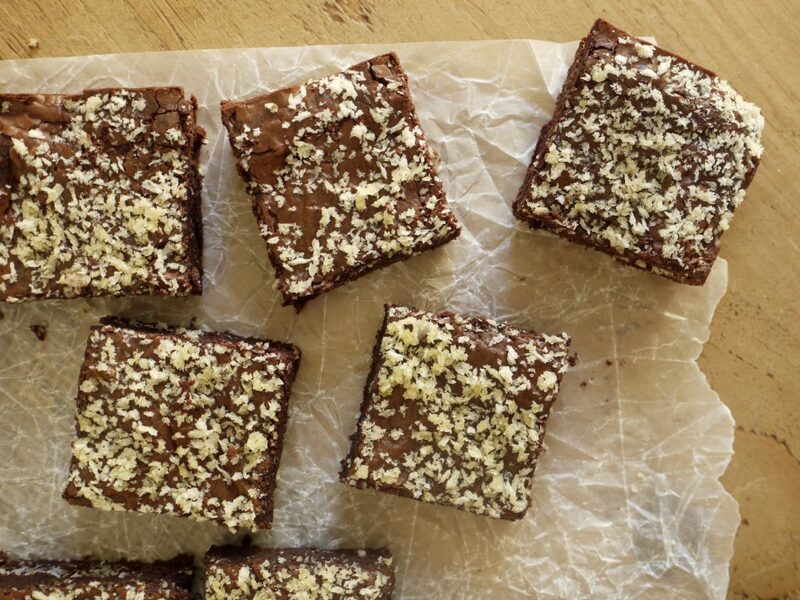 Brownies benefit from the addition of nuts so why not add toasted breadcrumbs? Here the panko is mixed with fruity olive oil and a generous sprinkling of sea salt to create something a little like feuilletine but less intense and easier for your average home cook to get hold of. 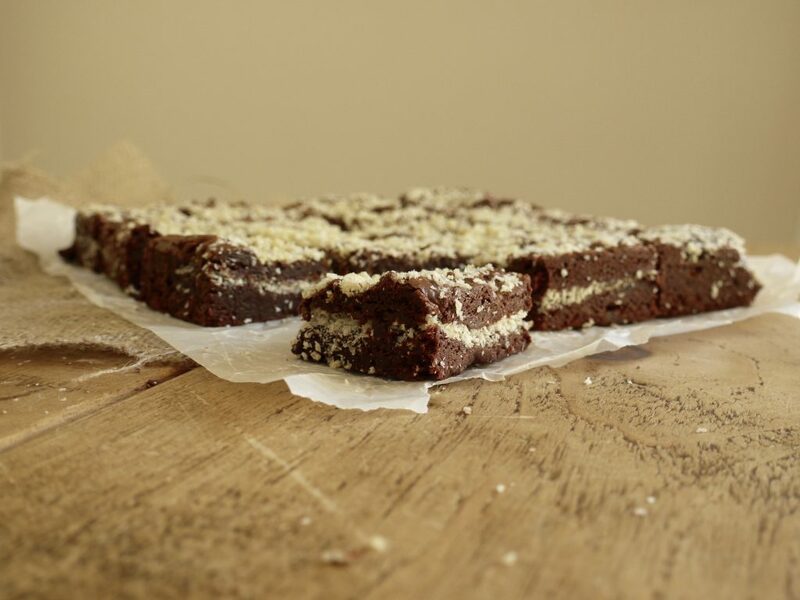 The salty crumbs bring out the sweetness of the brownie whilst creating a crispy foil for that dense dark interior. If you’ve ever eaten chocolate coated pretzels or crisps, these have the same sort of vibe, but in a classier, dinner-party-dessert-approved sort of way. 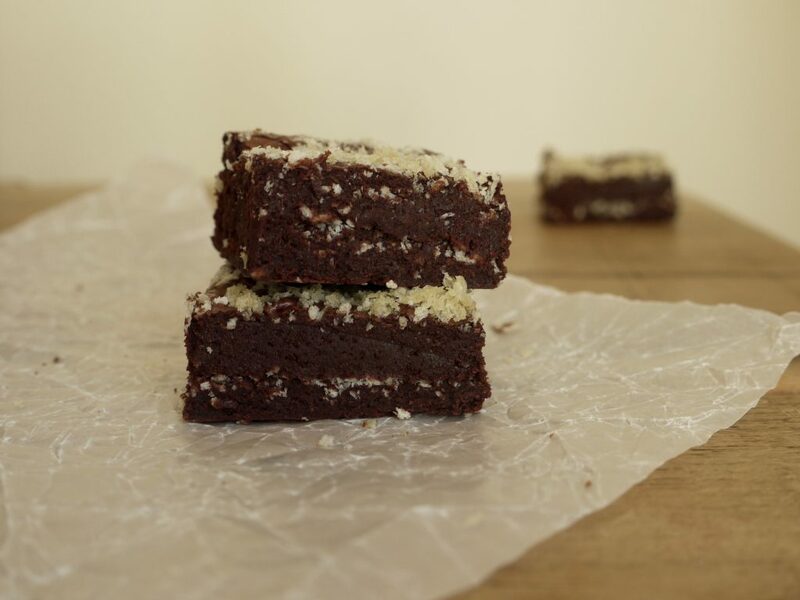 Serve these brownies as little bites with coffee after dinner or slice up bigger squares and serve with a big dollop of vanilla or – my latest obsession – dulce de leche ice cream. This recipe makes a large batch but you can pop any extras in the freezer and the defrosting process somehow makes them even more delicious – cold and crisp, sweetly dense and darkly chocolaty. Comfort food with an elegant twist. I developed these dark chocolate brownies with salted panko crunch for The Japan Centre in partnership with Great British Chefs. To get the recipe, click here. Ah Kate, I feel you. We were just in Canada for a family visit and a wedding, and the wedding was definitely a different kind of affair for me, and now the baby jetlag… a 9 hour time difference, so the little man wants to party all night long now! 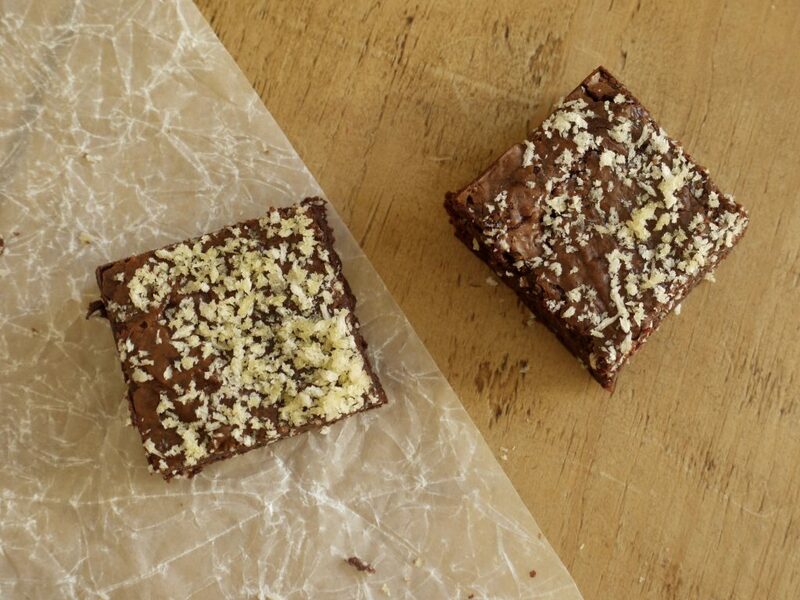 You’re my soul sister with these brownies. They’re first up on my list once the holiday detox is done! Ah life with a baby… so different (but good) haha! And I completely agree, brownies are the most comforting of all treats.